This one is really going to stretch the definition of "album" to the limit. 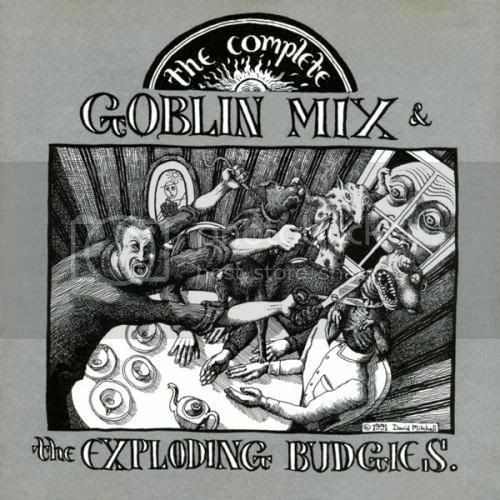 The closest thing to an album within this compilation is Son of Goblin Mix, which I think was a mini-album, and of which I'm not actually certain of the track listing. But the only way material from either of the (closely connected) groups represented here is easily available is through this compilation CD. Musicians (The Exploding Budgies): David Mitchell - guitar, vocals; Glenn Eisenhut - bass; James Murray - drums; Linda - vocals. Musicians (Goblin Mix): David Mitchell - guitar; Andrew Moon - drums; Alf Danielson - bass; Phil Moore - guitar, vocals. Songs: Thornfield; Kenneth Anger; Hank Marvin; See You Around The Stones; Sunflower; Lament; The Water; Time Away; Unusual Wish; Travelling Grave; Venus Fleye Trap; The Winter Song; The Drinking Man's Curse; Coleridge; Up From The Sink I Spy; Fruit Of The Womb; Ely's On Smack.